Maybe I’ve been inspired by the freakishly warm weather we’ve had off and on for the past week, or maybe I’m disturbed by the way it reminds me of impending climate disaster and I need something cheery to distract me. Whatever it is, I am deep into happy, bubble-gum-and-candy colors and adorable spring motifs for my crochet projects right now. I can’t stop creating these Fair Isle patterns for crochet. They’re so fun and easy to work up, and the sky’s the limit when you have a piece of graph paper and some colored pencils. Discovering Stitch Fiddle has made my pattern-writing even easier. You can see the graphed beginnings of this pattern in my last blog post. There’s something fun about being limited by squares and size boundaries. Here’s my most recent creation, and my very first pattern for sale on Ravelry. I wanted a pouch to keep my pill case in so the little containers wouldn’t pop open in my bag. The pouch can hold lots of little things, though: small notebooks, crochet gear, sunglasses, feminine products, etc. The body of the pouch is worked in the round in waistcoat stitch, also called center single crochet or split single crochet. This simple but beautiful stitch gives the knit stockinette appearance and makes it easy to create a “fair isle” pattern of images and designs. It’s not necessary to use the same yarns I used, unless you want an exact match to the final product. As long as all the yarn you use for this project is the same gauge, you should be fine. 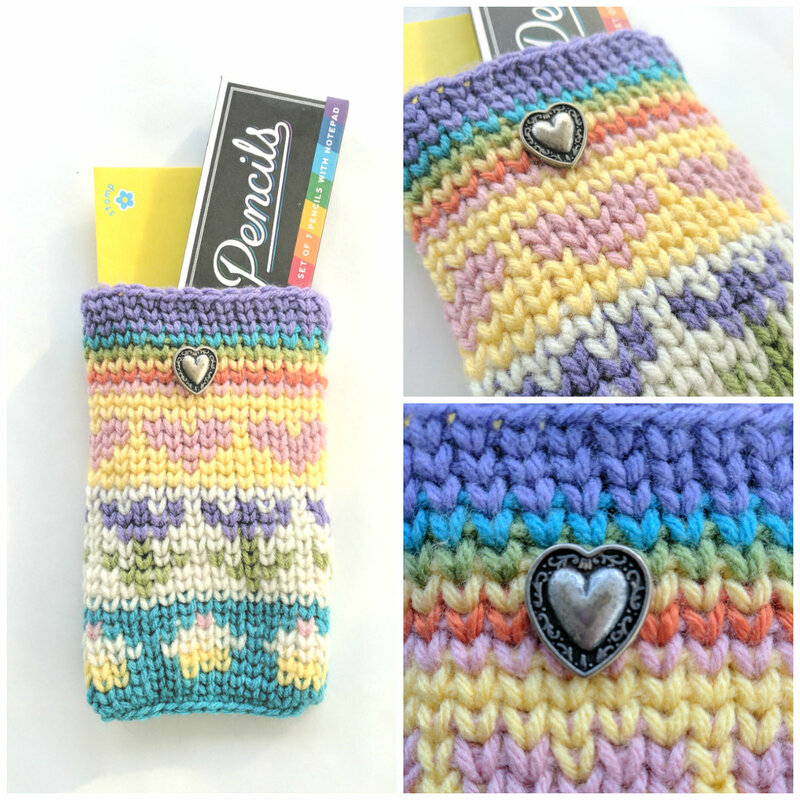 It’s a great project for using up small balls of yarn in your stash! Links to tutorials on waistcoat stitch and tapestry-style yarn carrying for color-work are included in the pattern. Detailed instructions for blocking are also included. A blocking mat is not necessary.